We have been calibrating the acoustic equipment for a few days in order to be ready for our survey of bottomfish. It was a long process, but necessary. Four of us worked on moving a small titanium sphere under the boat by maneuvering it to different positions. A scientist working in the e-lab (electronics lab) used different frequencies from the transducers to locate the sphere and record the results. 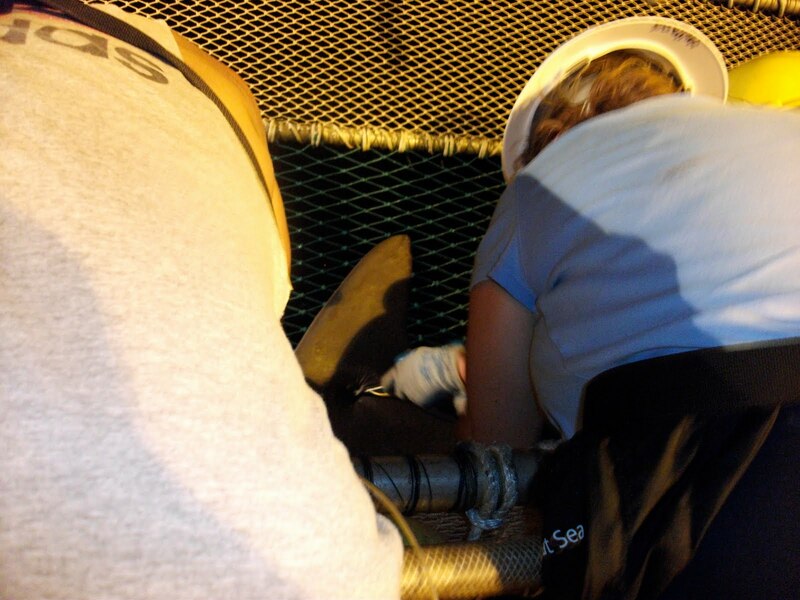 Graduate students and NOAA scientists worked until 1:00 in the morning to get the job done. While we were working on the acoustics, other scientists were working on a test run of the ROV. The currents were very strong when they deployed the ROV but it performed well and was successfully retrieved. Operating it is a lot like the controls to a video game, only the stakes are much higher. 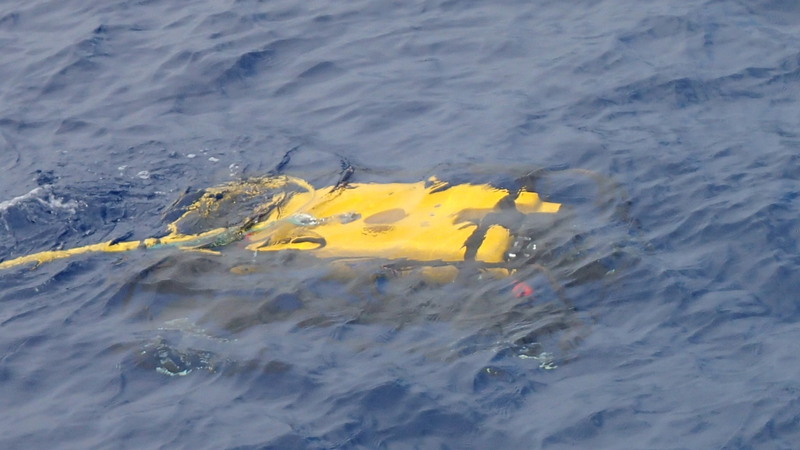 The AUV was deployed on Wednesday. The first step was to do a rehearsal of the procedures for deploying and retrieving the AUV. Everyone had a job to do and it was made clear who would be doing what and when. While it was obvious that certain people were in charge, they asked that if anyone thought they had a better idea of how to do something, or had a question, to speak up. 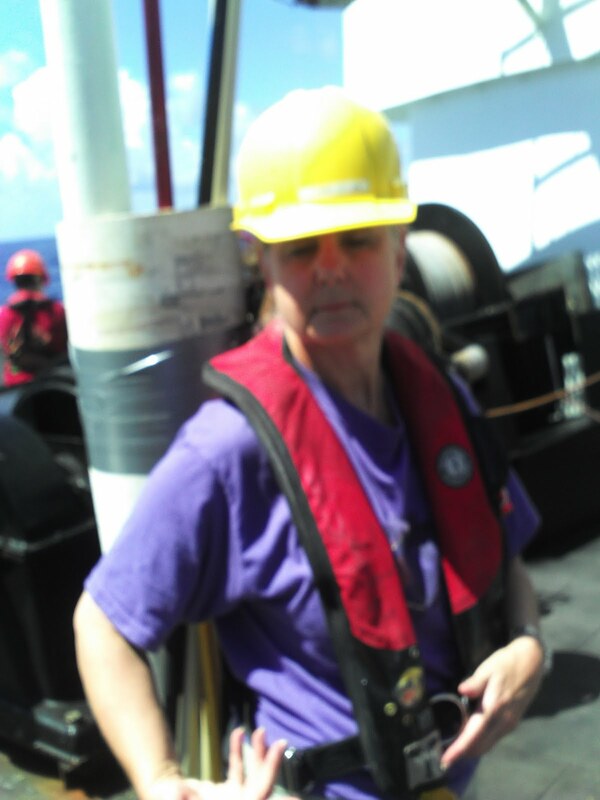 At one point, the captain, CO Koes, asked everyone who was not actually part of the procedure to move to one of the side of the deck so she could see who was actually supposed to be working. After the walk-through rehearsal, the AUV was lifted off the deck by a large crane and placed into the water off the fantail of the ship. At first it was tethered to the ship, but after awhile it was released and became independent of the ship. The scientists want to be as sure as they can be that the AUV will operate properly before letting it go so they run through a checklist. If everything is working correctly, they release the AUV. The AUV is pre-programmed for the mission so it is important to know about the underwater geography of an area. The AUV needs to be within 30 to 35 meters of the ocean floor in order to know where it is. Other than that, it follows the pattern that the scientists created. If the AUV doesn’t return to the ship, it’s a big deal. It’s very expensive and difficult to replace. The scientists designed it with that thought in mind. 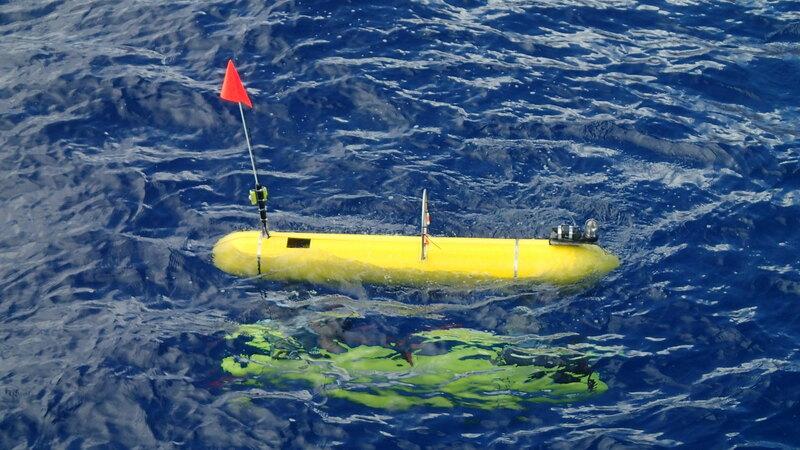 In addition to the high-tech solutions programmed into the AUV, the scientists also included low-tech ideas into the equipment to retrieve the AUV in case something goes wrong and the AUV is submerged and unretrievable. There is a “drop weight” attached to a strand of zinc. Zinc corrodes quickly in salt water. Through testing the scientists have already determined how thick the zinc strand should be in order to corrode through in a given amount of time at a particular water temperature. The strand that they are using on this cruise is constructed to corrode through in 5 1/2 hours. Once it corrodes, the weight drops off and the AUV rises to the top of the water where it can be seen and picked up. The zinc strand is replaced and another weight is attached. All the weights are the same size and weight so they are interchangeable. 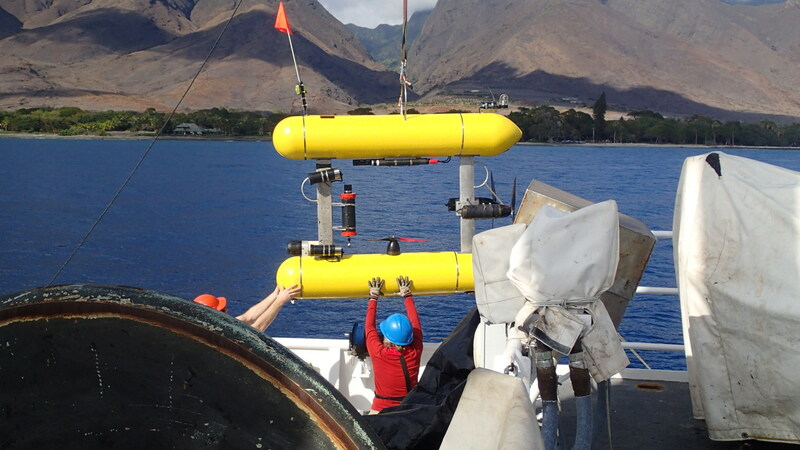 Otherwise, the scientists would have to recalibrate the AUV every time they changed weights. I was really impressed to see that the scientists use a combination of high and low tech to make their AUV successful. Heat-sealing the ground up squid and sardines for bait. The scientists on the Oscar Elton Sette use some smaller boats to assist with their research. One thing that I do to help out is make bait for the small boats to use to attract fish. We take frozen squid and sardines out of the freezer a few hours before we need them and put them on a protected place on the deck. After they thaw, we put them in a commercial quality food processor and grind them up into marble-sized chunk. 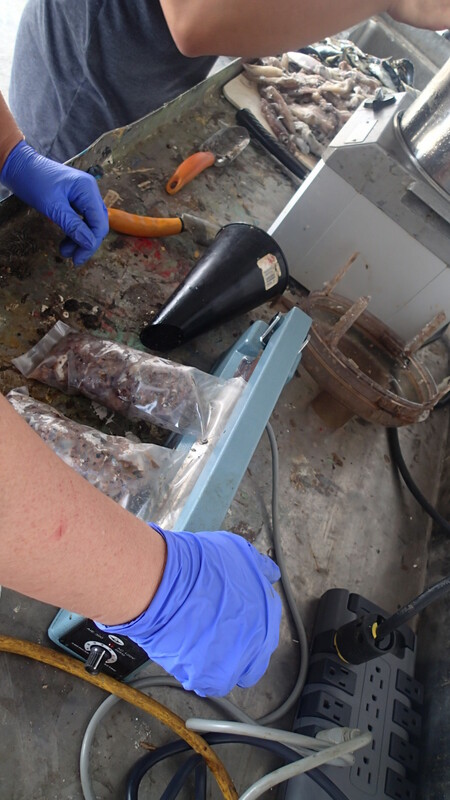 Then we put the chunky bait into plastic bags, seal them, and put them back in the freezer until they can be delivered to the boats that need them. This ship is amazing! It’s big and packed with the scientific equipment. The “wet lab” has become the acoustics lab for this trip and the e-lab is above that. The mess is open 24 hours for snacks, (as long as you clean up after yourself), and serves three meals a day. The cooks are really talented and are always providing fresh new ways of serving something. Fortunately, there’s a gym a couple of decks beneath mine! 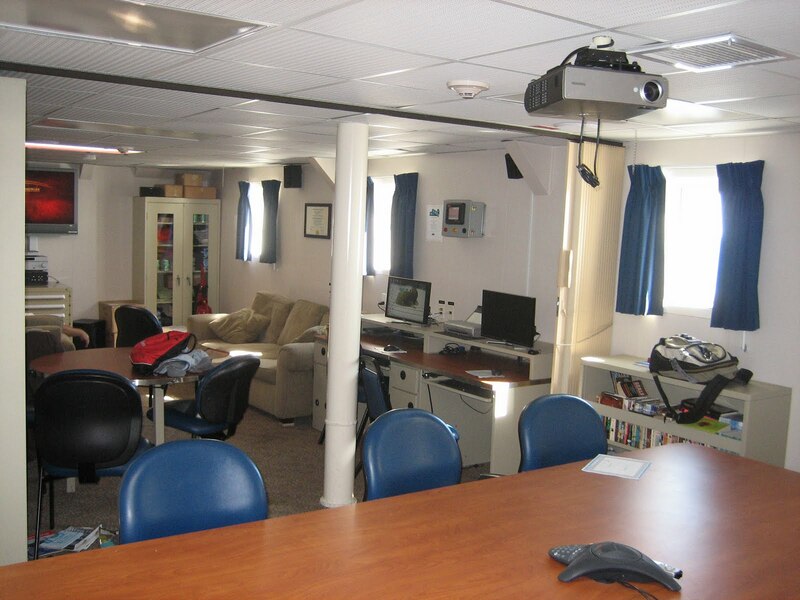 There’s a movie room, a laundry, a tv room with books and computers, and a ship’s store. There’s even a full-time medical officer on board. My stateroom is set up well. There are 6 spacious bunks, drawers under the bottom ones and lockers for everyone, built-in desks with ethernet access, and a large bathroom. Since everyone is on a slightly different schedule we do our best to be quiet and to keep the lights low. Uli Uli Manu taking a break on my bunk. 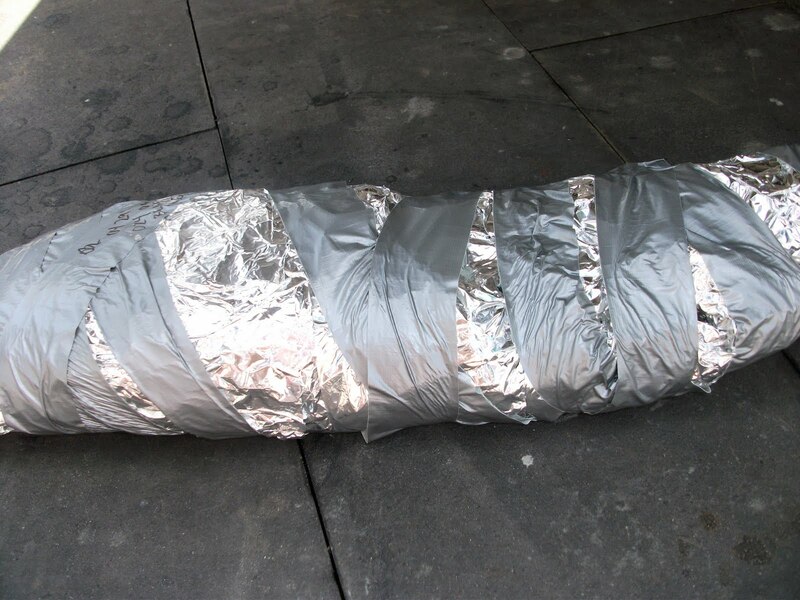 On Tuesday, we had emergency drills. Everyone has a specific place that have to go to when the alarms sound. If it’s a fire alarm or a man-overboard drill, I have to go to the Texas Deck. 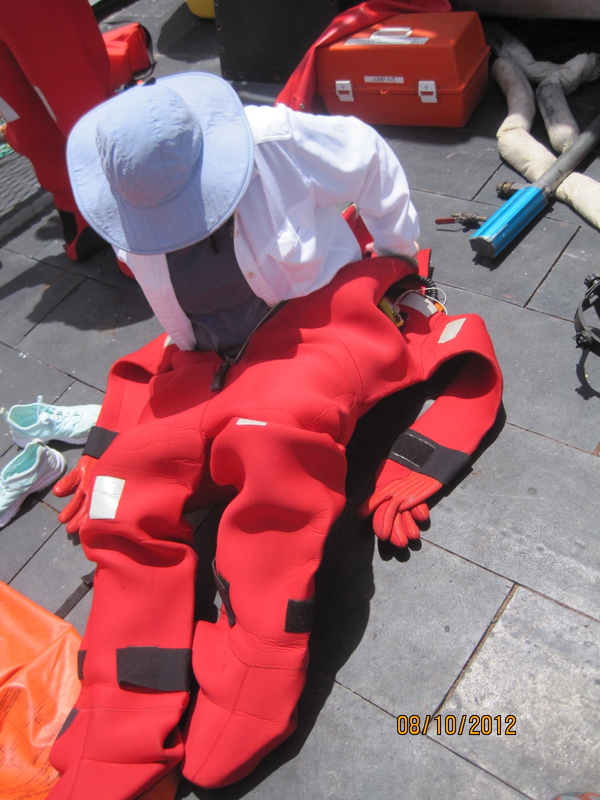 If it’s an abandon ship drill, I go to the boat deck and put on my orange gumby suit. That was a little tricky and very hot, but I’m glad they let us practice it. One thing I’ve noticed on the ship is how everyone has a job to do, but they are always ready to pitch in and help someone else. Meals are really interesting. The mess is small and has several tables set up with 4 chairs at each table. People sit with different people all the time. It doesn’t seem to matter who is an officer, a crew member, or a scientist. Everyone sits with everyone else. The Oscar Elton Sette as seen from a small boat off the coast of Maui. soon. I was impressed by the number of back-up plans in place. There didn’t seem to be one piece of equipment that didn’t have another piece doing the same job in a slightly different way. This allows the ship to continue working properly on the chance that something stops working. 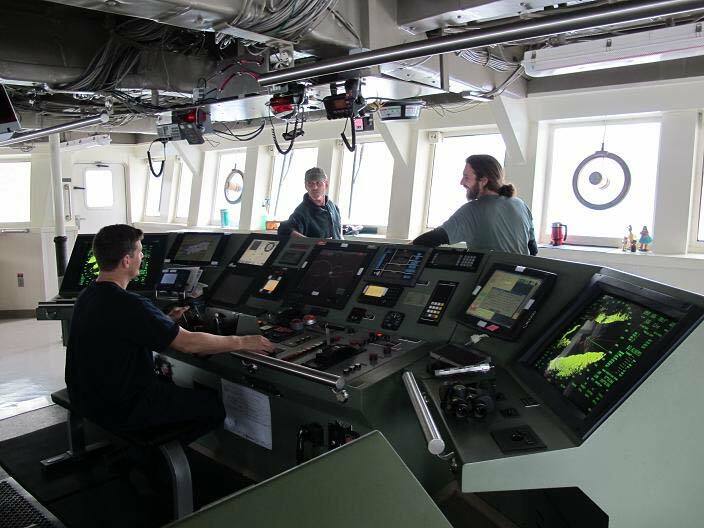 The bridge is the control center of the ship and has alarms and notifications for anything that might crop up–low fresh water levels, smoke, fire, and anything else you can think of. Sound is vibration transmitted through a solid, liquid, or gas. The speed of the vibrations, or how quickly they cycle, determines the frequency. Frequency is measured in cycles per second, or hertz (Hz). Humans can hear certain frequencies, while bats and dogs can hear others. 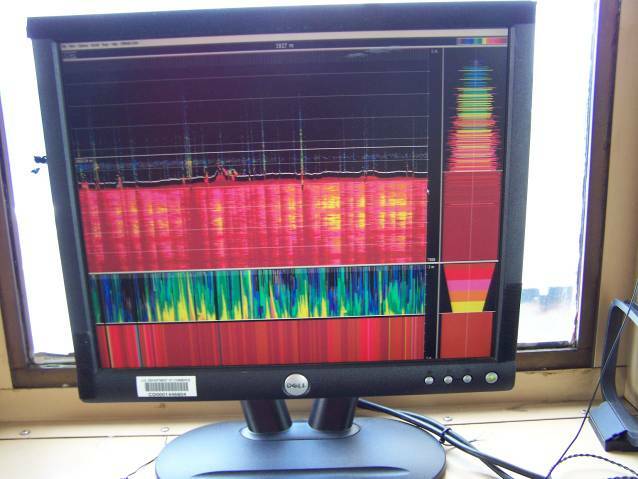 Whales and dolphins hear even more frequencies. 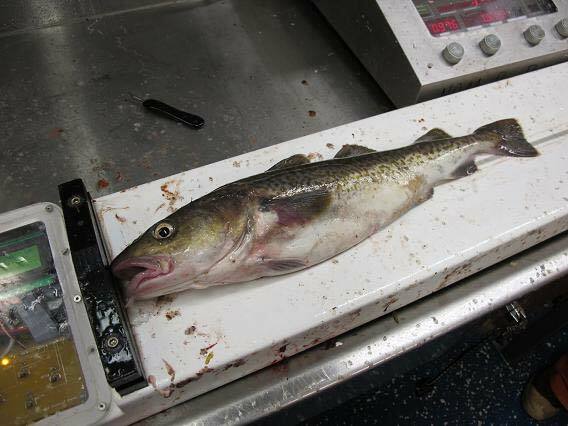 The sound waves we are using on the Oscar Elton Sette will bounce off the fish and reflect back to the ship, allowing the scientists to locate the fish and determine their shape, size, and movement. Current Geographical Position: Traveling south along the east coast of Florida to move into position to start survey work. I spent time on the Bridge (where the Captain and Crew pilot the boat) this morning learning about the weather data collected and all of the gauges and levers and images that they use to guide us. Captain Dave Nelson was nice to share information with me while he did the important work of piloting. He was being careful to not get to close to all of the small boats that were out on the water fishing and enjoying the beautiful day. On the radar it looked like we were surrounded by about 20 boats, looking out the windows I could only see one. The radar technology helps extend the Captain’s view of the water so that all of the boats stay safe. The Bridge Crew record the weather every hour of the day and night. The above readings are for 11:00 am. 27.1 degrees Celsius means it is warm out. It is about the same temperature here today as it is in Albuquerque. The difference is that there is more moisture in the air in Florida. I’ve always called it muggy, when I feel a little bit damp all the time. 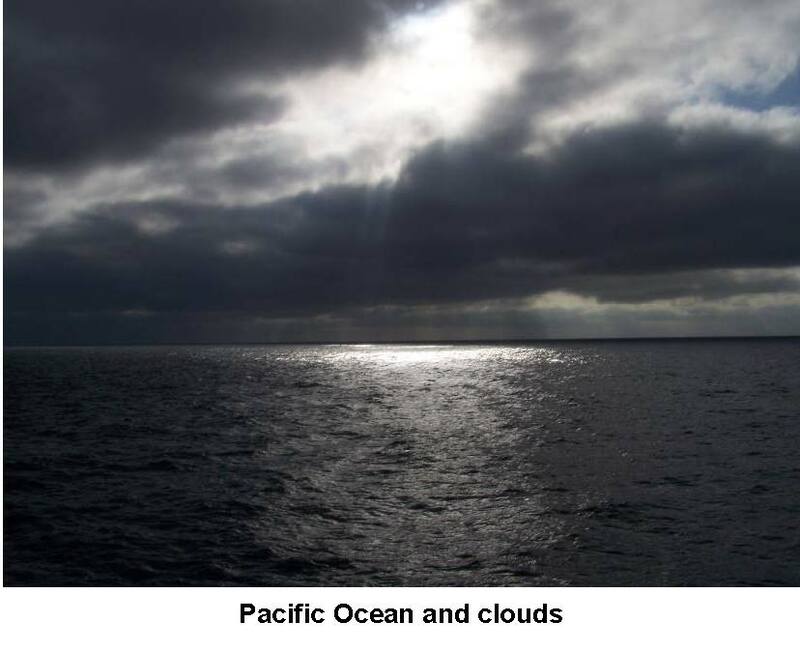 The crew measures cloud cover by dividing the sky into 8 sections and seeing how much is covered by clouds. 5/8ths means more than half of the sky is covered. 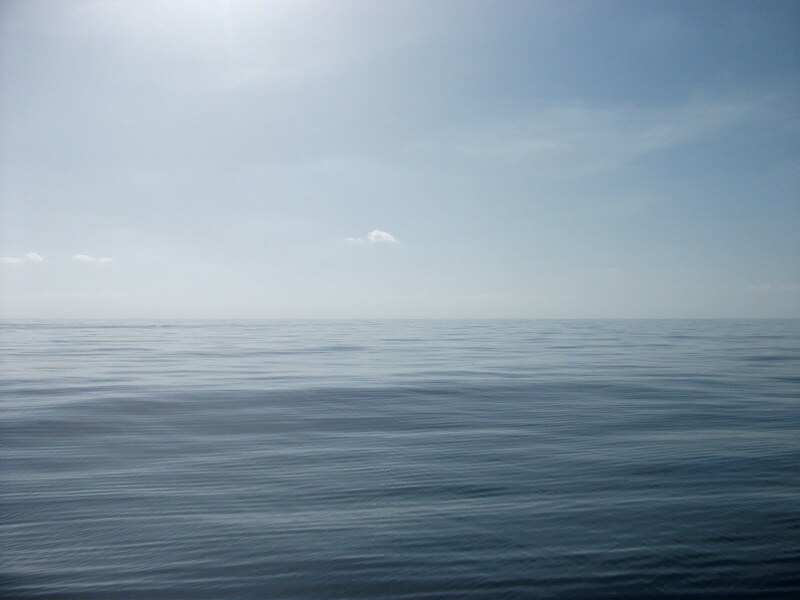 Here on the water we can see pretty far out in all directions, which is called visibility. 0 visibility would mean that the boat is fogged or rained in and can’t see past the boat at all. We have 10 miles of visibility which is pretty far. The water is almost flat when I look at it, only a few ripples. The range of wave height is 0-1 foot, but what we are seeing is closer to zero. Since waves are caused by wind, there can be different heights of waves at the same time so a range is used for the measurement, sharing the shortest and tallest of the waves. 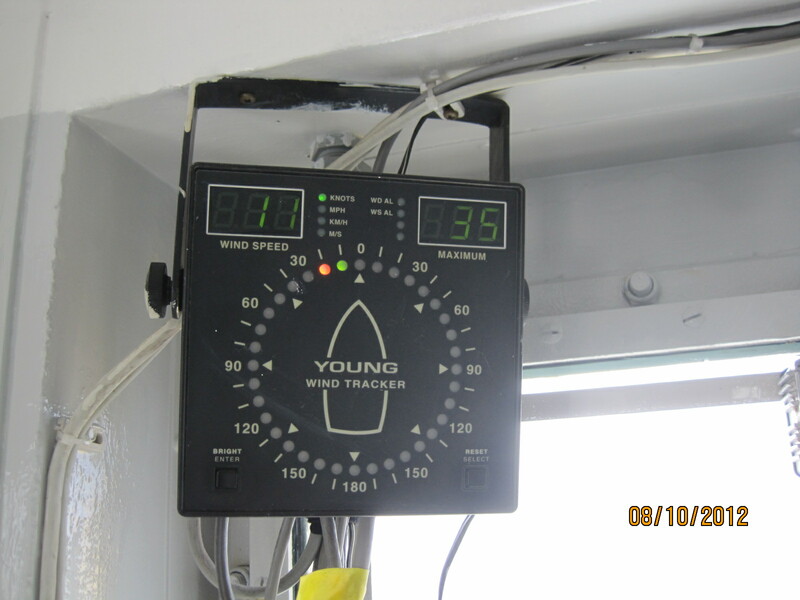 Wind speed and direction are also recorded. 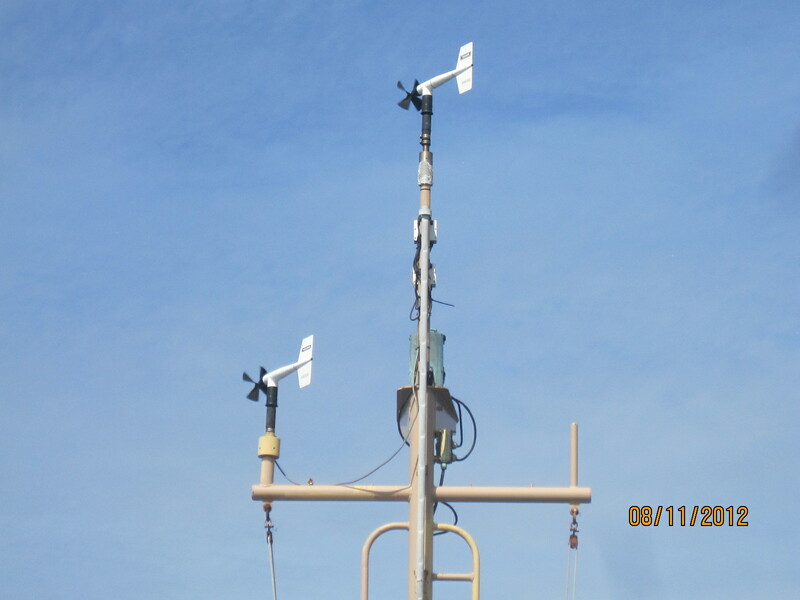 The wind monitor looks like two small, wingless airplanes up on top of a mast. Wind speed and direction are read on this device on the bridge. Happy Birthday, Mom! It’s my mom’s birthday and since we are along the coast of Florida (I can see the buildings along the shore), I was able to call on my cell phone to personally wish her well. She was surprised! I told her before I left that I would not be available much since signals won’t work when we are out at sea. There is a satellite phone that works all of the time on board for emergencies. We are never completely out of contact, but people who work on a vessel go long periods of time without phones or internet. Since we are still moving toward the place where we will start work, many people are spending time out on deck on their phones connecting with their families and friends. They know if they can see the tall buildings lining the shore that they can call. 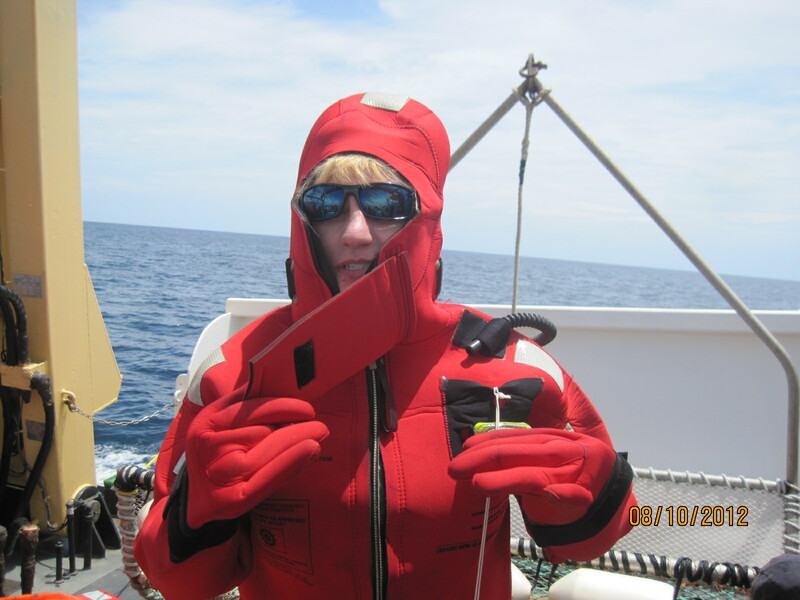 Since we are not going to be able to start the survey until we are past the Florida Keys and into the Gulf of Mexico, we spent time learning about NOAA Ship Oregon II and conducting safety drills. Personal Floatation Device properly cinched! A ship is like a city. Everything that people need to live, stay safe and be happy needs to be provided. William gave me a tour of the Engine rooms before we left Mayport. 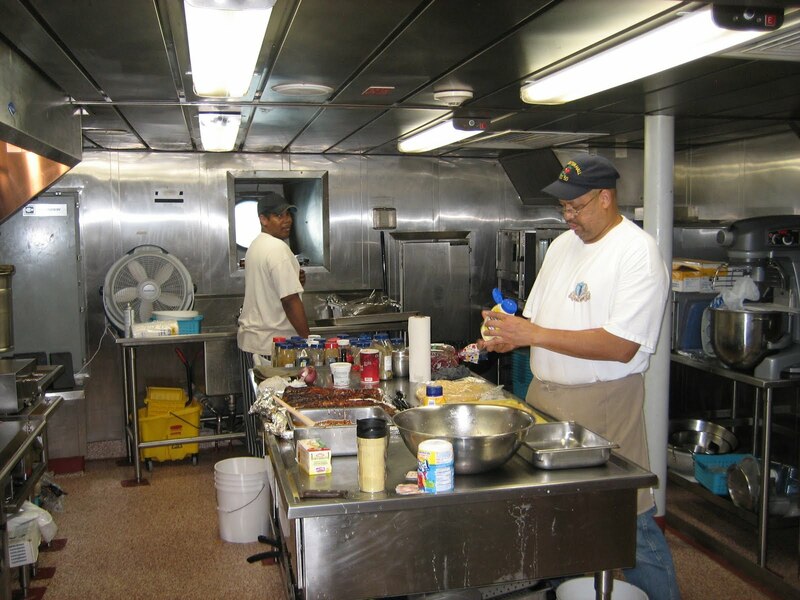 Once the boat is underway, the engine rooms are very, very hot and super noisy. The Engineers make sure to wear earplugs and drink lots of Gatorade to stay hydrated and keep their hearing. The engines are connected to a long shaft with gears (hey 1st and 4th graders, do you remember learning about simple machines last year?) which move the boat forward. There are two of everything on board so that if one breaks down there is a backup. This is called redundancy. For the really big pieces of equipment they need to be placed to balance the weight on the ship. This leads to something you have studied in math, Symmetry. Many places I look I see mirrored pairs of objects. See if you can find the lines of symmetry in the following pictures. 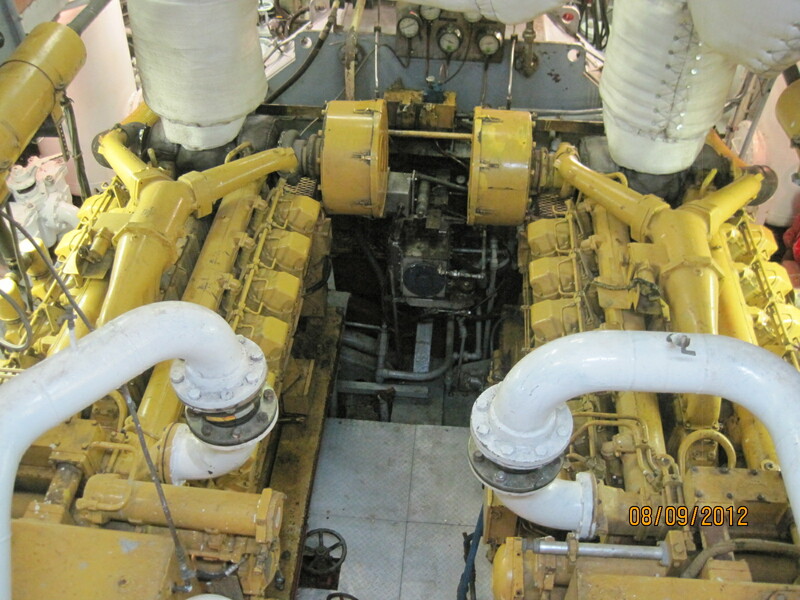 Two engines in the Engine room below decks. Look for symmetry and balance on the bow. 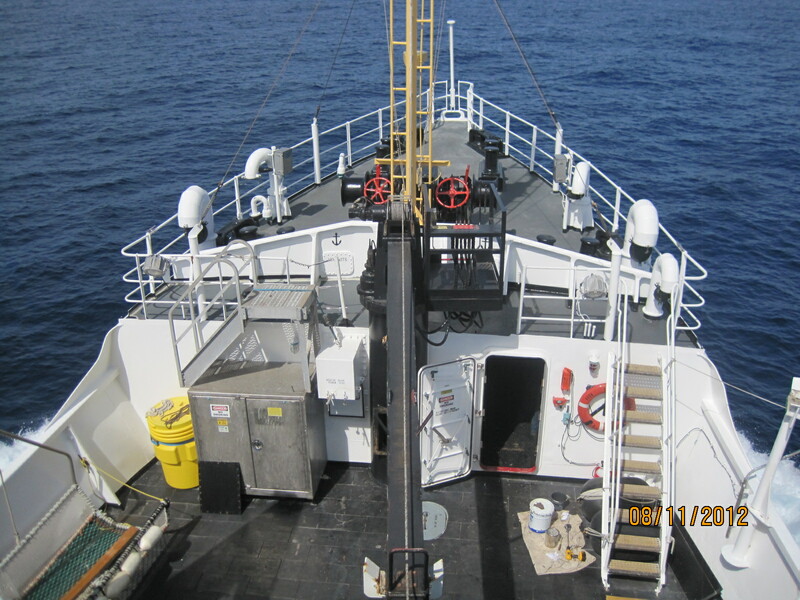 I will be sharing more about NOAA Ship Oregon II, the people on board and surveying sharks later. We will just keep heading south to the Gulf. We are about an hour away from out first data collection area. This morning just before dawn I got a tour of the bridge. The CO showed my all the computers that keep track of where we are. I learned a lot, not only about the bridge but also about careers in NOAA. 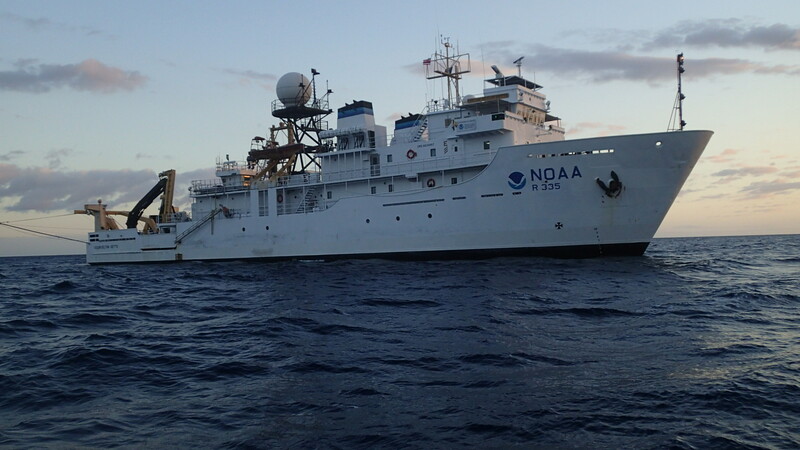 (National Oceanic and Atmospheric Administration).. NOAA is made up of several parts, the CO and I talked about the oceanic parts; the officers and crew who run the ship and the scientists. The officers follow the same rules as the military. If you are in the Navy you can transfer directly into this division. 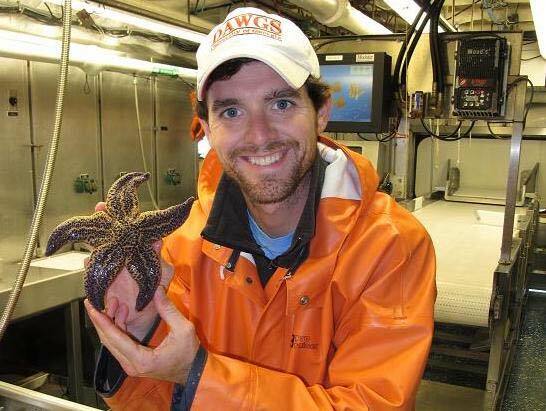 The scientists do the actual research designed by NOAA to answer questions about the ocean. 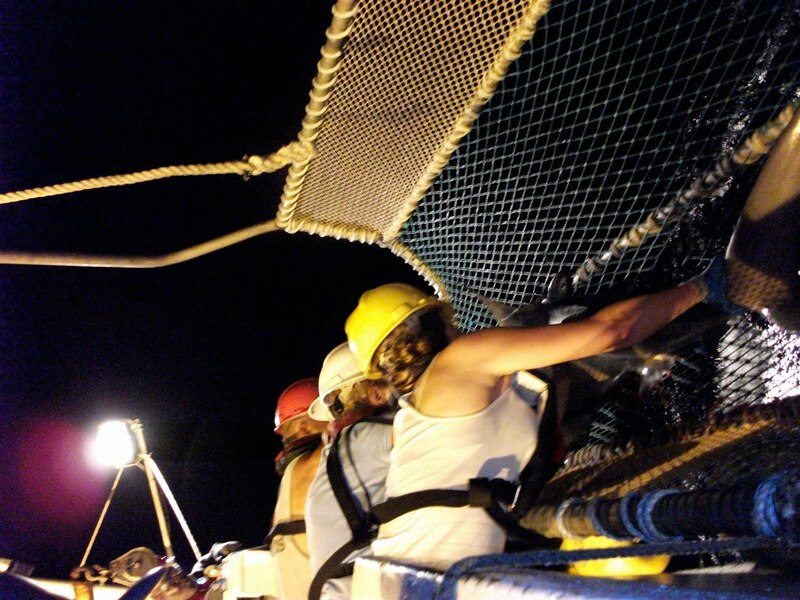 In this cruise we are counting, tagging and releasing shark. This will tell us about how many sharks are in this area at this time of year. NOAA has collected data for twenty year so they will be able to tell the health of the shark population. To help collect information of the effect of the oil spill we are also doing water analysis and plankton tows. After lunch we were taught how to do a plankton tow. I have done numerous plankton tows in my life but never on this scale. 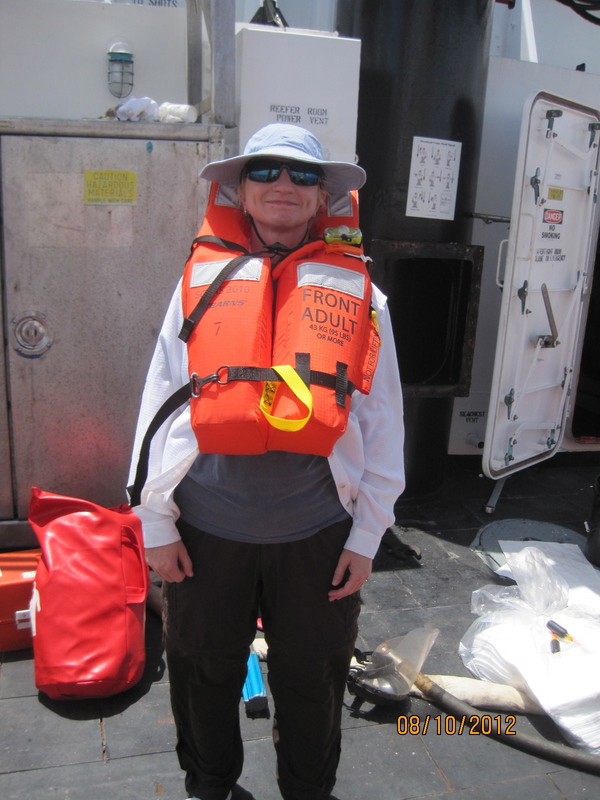 I used all the skills that I learned when I did research in the Arctic except on a much larger scale. The last few days I have spent some time up on the bridge of the Ka’imimoana. Ensign Linh Nguyen, one of the NOAA Corps officers, showed me around and explained some of the equipment. They have three general types of equipment available on the bridge which I will categorize as: communication, propulsion, and navigation. The communications system first includes intra-ship lines. These are mostly carried out by an intercom type system. Each major area of the ship (including each stateroom) is connected to this intercom system by a phone that permits communication with any other part of the ship. 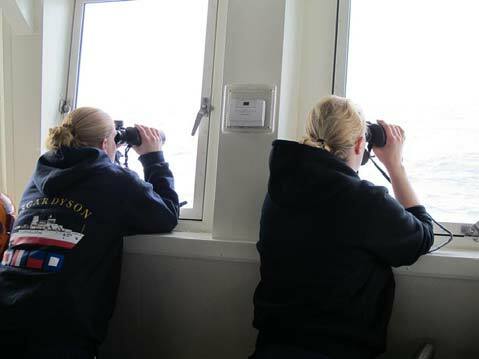 The ship also has numerous hand-held radios available for use when one is not near a phone. 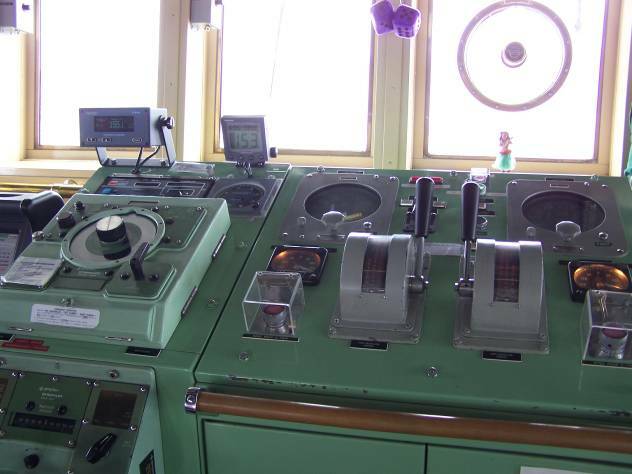 In addition, the bridge has both inter-ship and ship-land communication capabilities. 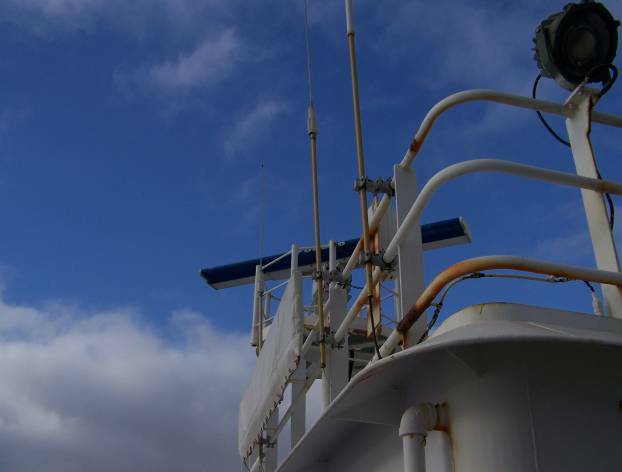 The KA (short for Ka’imimoana – Hawaiian for Ocean Seeker) also has access to the Iridium satellite platform for communication with land in addition to access to a satellite internet and internet VOIP system. There are two types of propulsion on the ship. 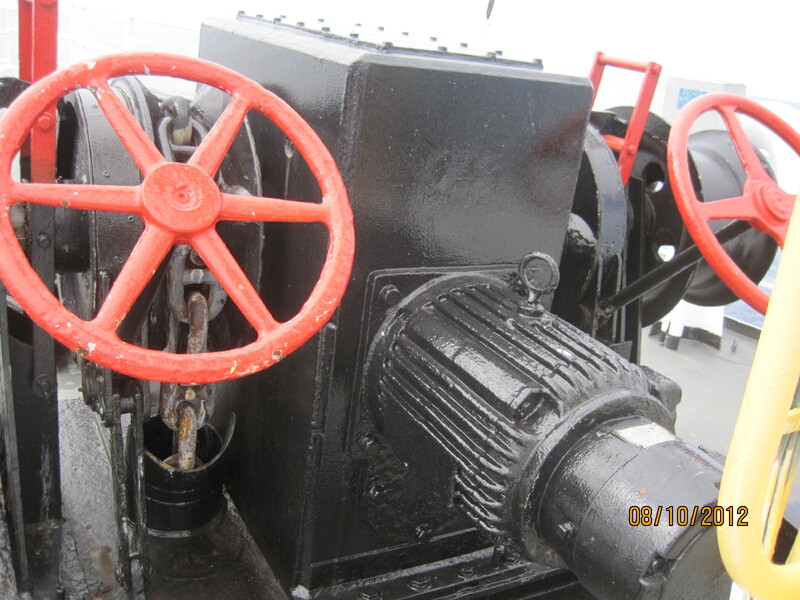 First, there are four large diesel engines that power a generator. 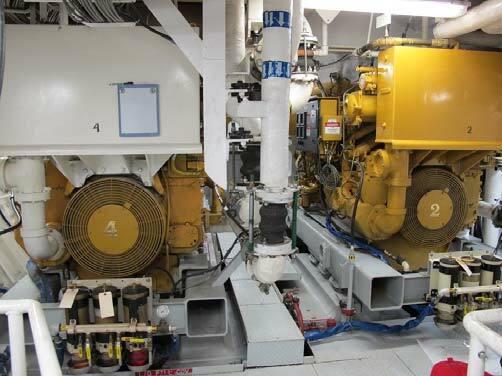 This generator produces the electrical power that runs each of the two electric motors that drives the screws (propellers) located at the stern (rear) of the vessel. While moving through the harbor all four diesel engines are running sending power to the generators. When the ship is out at sea only three of the diesel engines are used. The ship can operate with only two engines in service for power generation but under this configuration the ship will cruise at slower speeds. The KA has two screws: port (the left side of the ship if one is facing the bow or front of the ship) and starboard (the right side of the ship if one facing the bow). Each screw runs independent from the other with separate controls on the bridge. The conning officer (the officer who is in charge of the bridge at any given time) can change course by turning the rudder (the most common way) or by altering the speed (rpm) of one of the screws (without using the rudder). The KA also has a bow thruster (also powered by an electric motor) that is mounted in a tunnel through the forward part of the hull. 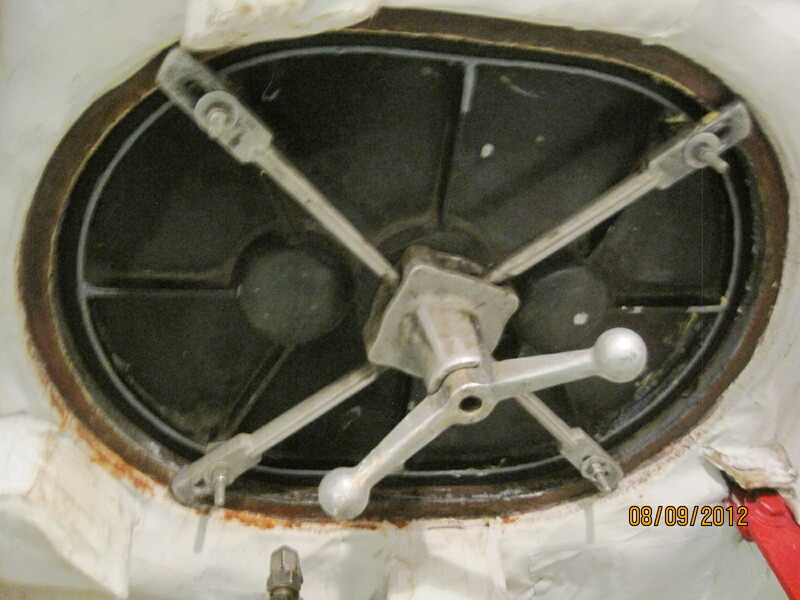 This thruster permits the conning officer to move the forward part of the ship port or starboard without the main screws driving the ship forward. The bow thruster allows more subtle and precise motion that could be used for docking or perhaps helping keep the ship over a precise location while collecting data at those particular coordinates. The captain of the KA, LCDR (Lieutenant Commander) Matthew Wingate, described the navigation system of the KA as modern but not state-of-the-art. The ship has many redundancies built into its guidance system. 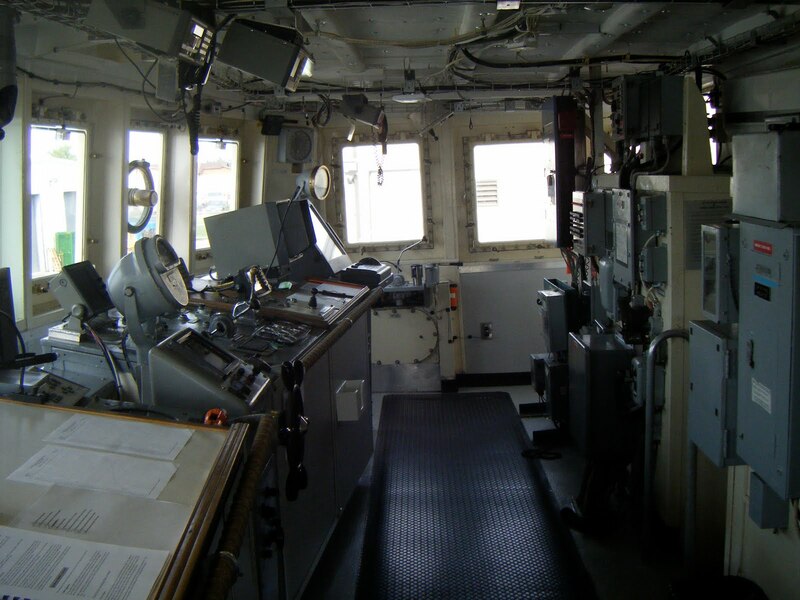 Two radar consoles, three compasses (two digital/electronic and one analog), an AIS (Automatic Identification System), paper charts, a fathometer (sonar) and of course, binoculars and the naked eyes of those on constant watch. The radar system is quite fascinating. It has an adjustable range with the ability to scan out to almost 100 nautical miles. The system plots the projected course of the ship and the predicted course of other ships within its range using vector analysis. This information is necessary to be able to prevent (well ahead of time) any possible collisions that might take place if the ships hold to their current courses. In addition, it is possible to set a radar alarm range of a particular radius around the ship. If any object comes within that range an alarm sounds to alert the pilot of the danger. 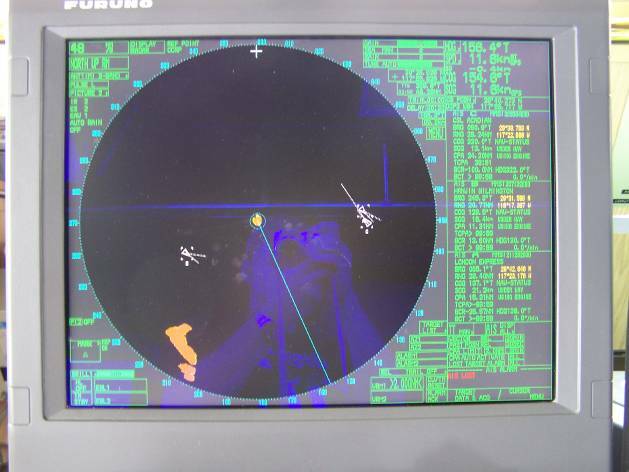 While I was on the bridge there were three other ships registering on the radar monitor each traveling in different directions. 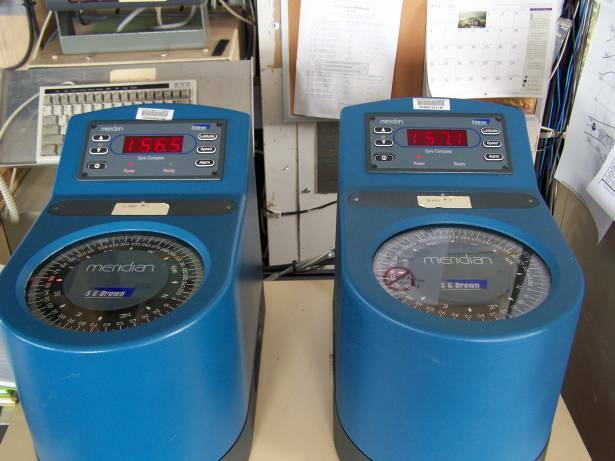 The two digital compasses are mounted side-by-side and their readings (and the difference between the readings) are projected at the navigation console. Above one’s head and not far from the digital compass readout is also a standard magnetic compass. The AIS (Automatic Identification System) is probably the most fascinating device I have seen on this ship. It is similar to radar readouts but provides much more information. First, one needs to understand that when ships are at sea they continuously send out a signal that provides identification information. The AIS receives this information and plots the locations and courses for these ships in addition to the location and course of the KA. All of this information is superimposed on a digital nautical chart that shows islands, shoals, exposed rocks, depth contours, and continental shorelines that can be adjusted for different scales. 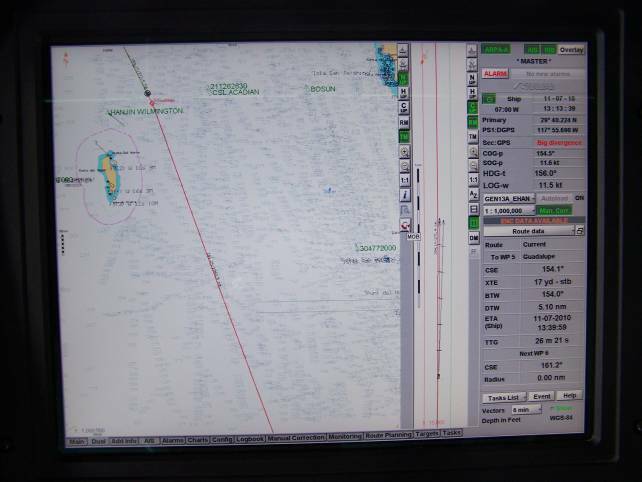 At the right margin of the AIS screen is listed navigation information such as the latitude and longitude of the ship, course bearing, ship speed in knots, and other pertinent data. Besides the course plotted on the AIS the conning officer also plots out the ship’s course on a paper chart and cross-checks it with the AIS. The fathometer shows the depth of the water under the ship and therefore the contours of the ocean bottom. This information can also be cross-checked with the charts and the AIS to make sure that they all agree. Last of all there is always someone on the bridge keeping watch on the instruments and the horizon verifying what is on the charts and monitors with what they see with their eyes through the binoculars. I have enjoyed walking about the ship during the day taking pictures and looking at the various types of equipment on the decks. I hope to describe these in later logs. 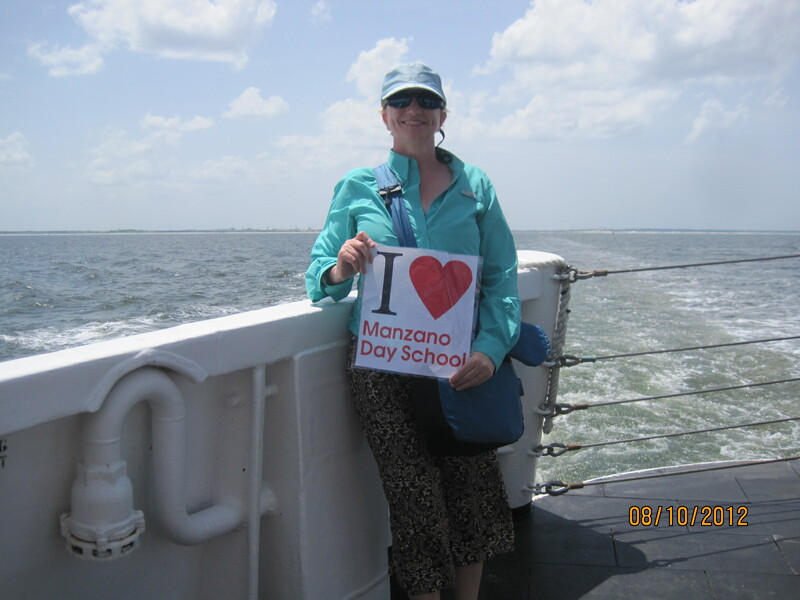 I was on one of the lower weather decks this morning simply taking in the views of endless water in all directions. When the sun is out the water has a deep blue color with a very slight greenish tint. As the bow cuts through the water, waves and foam are pushed out creating a variety of tints of blues, greens, and white. It is beautiful indeed. While I was watching, out popped a flying fish! 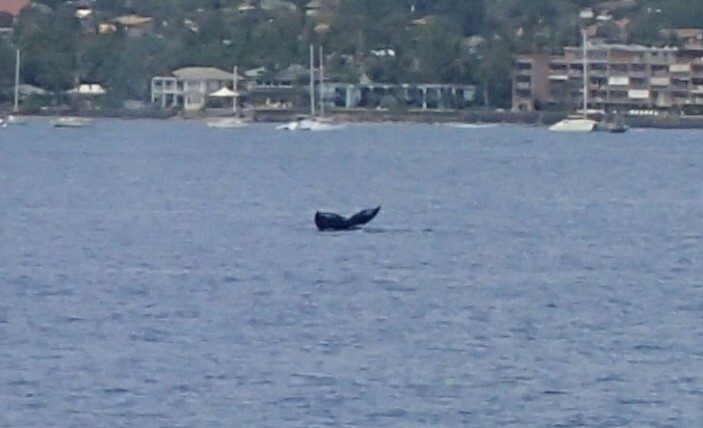 It jumped out near the bow wave and glided about a foot off of the water for about 50 yards or more. When it would hit a wave crest it would boost itself with its tail and go a little farther. I stayed at that location for another half hour and watched many others, some small groups, and several large schools of 50 or more “fly” at one time. The longest “flight” was about 100 yards with the fish in the air maybe 5– 10 seconds. 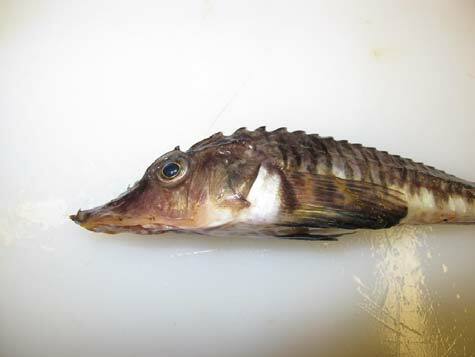 I would not have even thought to look for one of these fish. Like most children I had read about them and seen pictures of them when I was younger but never really thought that I would ever see one. What a great surprise. Being from Idaho’s northern latitudes, the sun only gets approximately 67Ε above the horizon on the Vernal equinox. It has been interesting to have the sun literally directly overhead during a portion of the day. This, of course, produces few areas of shadow to get out of the sun’s harsh equatorial rays. When we left San Diego it was in the mid to lower 60’s but as we have worked or way south (about 200-250 miles per day) the temperature has been slowly rising. I am told that it will soon be very hot and humid so I should enjoy this mild weather while I can. I have learned a few new terms for parts of the ship that might be helpful for future logs. Deck – refers to any floor on the ship. I would refer to the floor of my stateroom as the deck. Bulkhead – this refers to any walls on the ship. 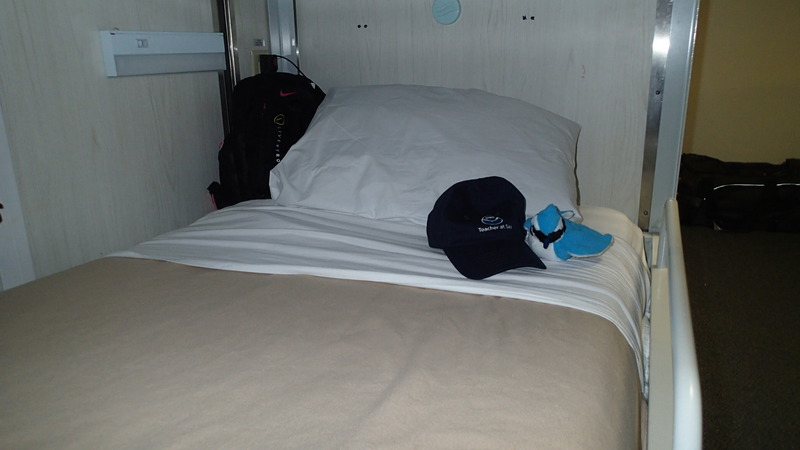 I am required to keep the deck and bulkheads of my stateroom clean. Head – this refers to a bathroom on the ship. I have a head that I share with a crew member in the stateroom next to me and there is also a “public” head available on this same level. Aft – can mean in back of, behind, or toward the stern of the ship. Forward (sometimes simply fore) – can mean in front of, in front, or toward the bow of the ship. Throughout this cruise I have been continually impressed with the engineering of the NOAA ship Oscar Dyson both in terms of modernization and capacity. 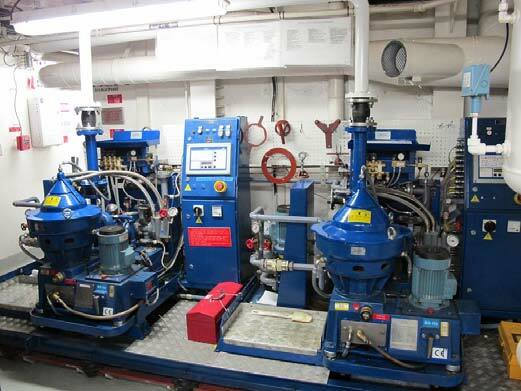 State of the art technology can be found throughout the ship from the bridge to the engine room. 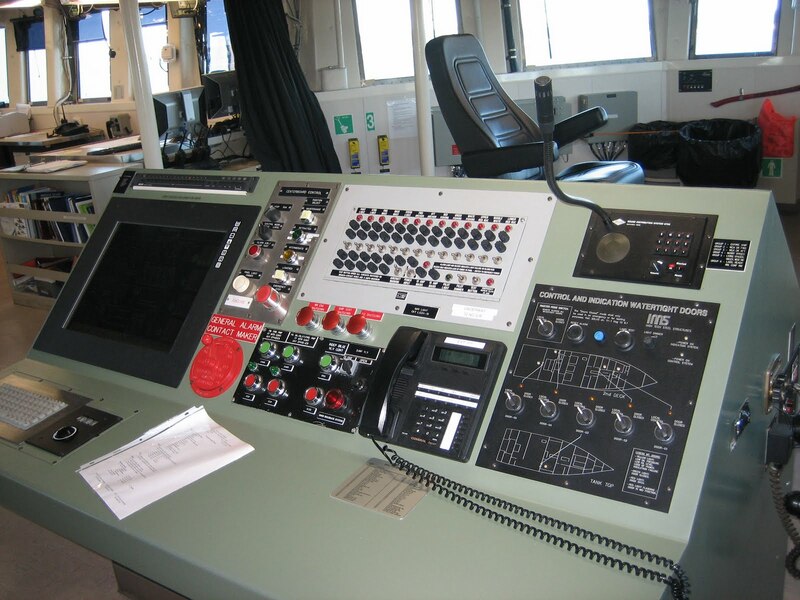 Computer touch screens are used to control such operations as navigation on the bridge, power management in the engine room, and data entry in the wet lab. Junior engineer Walter Daniel summed up the advanced look and feel of the ship well; in comparison to the many vessels he has encountered in his career, he likened the Dyson to the Starship Enterprise of the science fiction franchise Star Trek. Even though the Dyson is one of the most technologically advanced fisheries vessels in the world, the engineers still get their fingers dirty from time to time. Although most of the equipment in the engine room can be adjusted with the simple touch of a button, flip of a switch, or turn of a knob, the Dyson’s veteran engineers still carry a screwdriver and wrench in their back pocket. Fred Ogden, first assistant engineer, told me he always likes to be prepared to bypass the computers and be able to make an adjustment by hand if needed, and you need to have the right tools for the job at hand. Recognizing that sometimes a person needs to get back to basics and that one should always be prepared, Fred says he never goes fishing without packing his sextant. Tracing its origins to the days of Sir Isaac Newton, the sextant is a tool used for navigation that only needs a clear view of the sky and horizon to work! At full power, the Dyson can reach 15.0 knots or a little more than 17 miles per hour. A knot is a unit measurement of speed roughly equal to 1.151 miles per hour. Four diesel generators capable of 3,017 horse power turn the Dyson’s shaft and prop. Horse power is a unit of measurement of power. To give you some perspective, modern cars typically only have 125 to 200 horsepower. To ensure these generators operate as efficiently and cleanly as possible, diesel is first cleaned using powerful centrifuges (machines that rotate very quickly to separate oil from the fuel). Fuel is also filtered twice more in each engine using filters. By burning clean fuel, the Dyson reduces pollution output and increases the life of the generators. Most of the oil and dirty water can be filtered on board to remove the impurities and reused. The Dyson also has two desalinization machines. What is desalinization and why is it important? ‘Desalinization’ is easy to subdivide and define to reveal its meaning. ‘De-’ is a prefix that means removal or reversal. ‘Salin’ is a French root word that means salt. ‘-zation’ is a noun suffix meaning an action, process, or result of making. If you put the parts together, desalinization means the process of removing salt. Desalinization machines produce fresh water by removing the salt from seawater. The importance of fresh water on a ship at sea cannot be overstated. Fresh water is essential to the crew of the Dyson for drinking, food preparation, waste management, and washing. 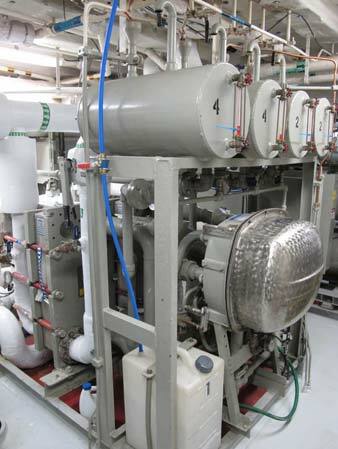 Fresh water is also used to remove the heat from the generators in the engine room and to cool living spaces throughout the ship. The generators give off so heat much in fact there is never a shortage of hot water for the crew! After touring the engineering spaces of the Dyson, I was surprised to see several work stations comprising of work benches and many hand tools dedicated to servicing equipment and fabricating new parts while at sea. Any one of these machine shops would satisfy any suburban Mr. Fix-it! 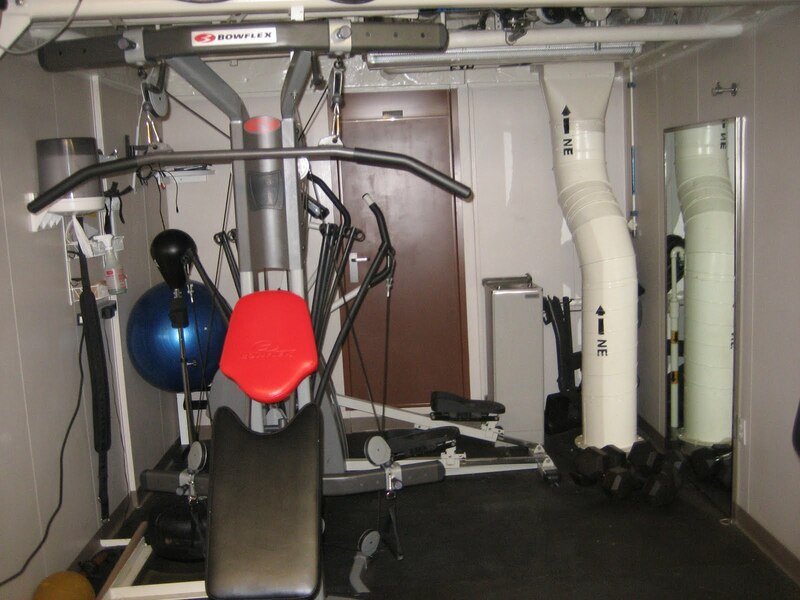 In addition to these work stations, the Dyson also has numerous storage cabinets and cubby holes located throughout the ship storing everything from screws and zip ties to transistors and electronic circuit boards. The extent to which technology has permeated the Dyson is revealed by the maze of wires found overhead in every room and passageway. The many wires and pipes snaking from one room to another remind me of a giant circulatory system. The Dyson has two rotating Electronic Technicians, Vincent Welton and Stephen Macri, and an Engineering Electronics Technician, Terry Miles, whose job is to keep all these technologically advanced electronics in good working order. One of my favorite places on the Dyson is the bridge. The bridge of the Dyson is the command and control center for the entire ship. 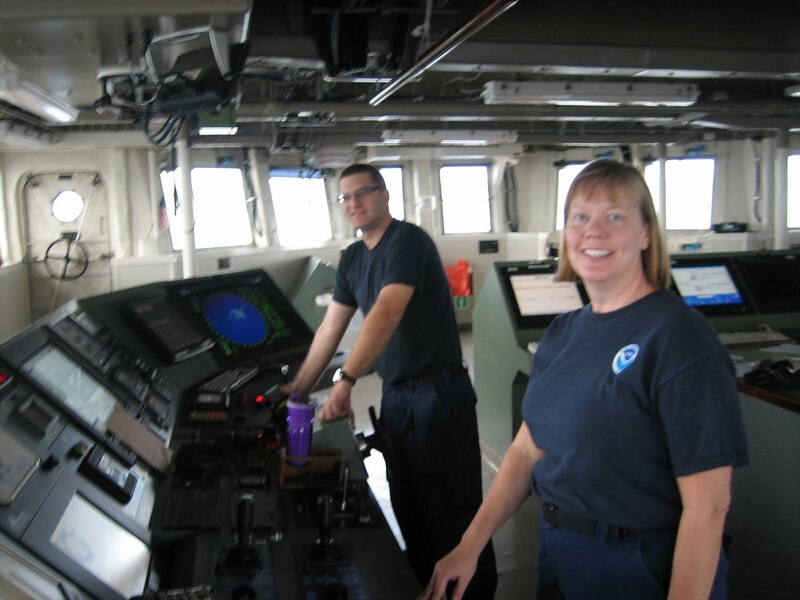 The bridge not only allows the NOAA Corps officers to safely navigate the Dyson but allows communication with the entire ship, nearby boat traffic, and the shore. 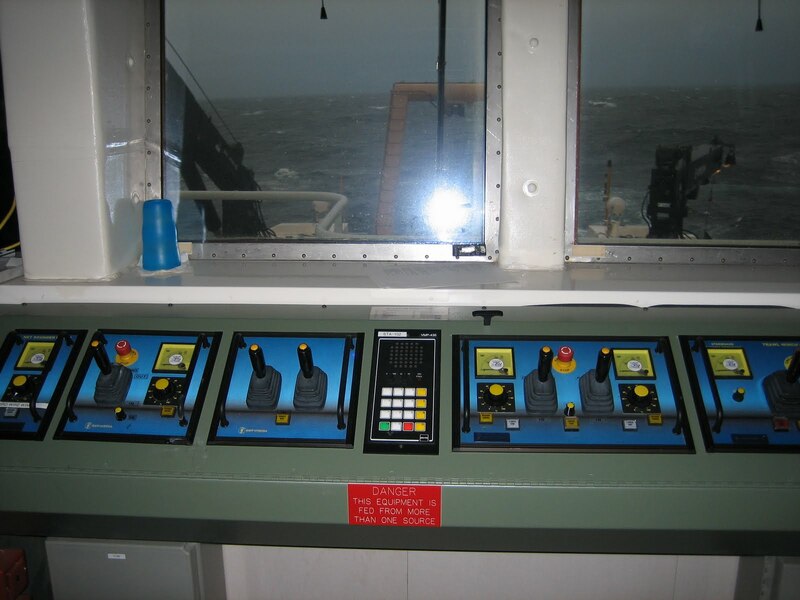 Utilizing radar, electronic charts, magnetic compasses, GPS, sonar, advanced radio and communication equipment, and various weather instruments, the bridge provides a wealth of information at one’s fingertips. 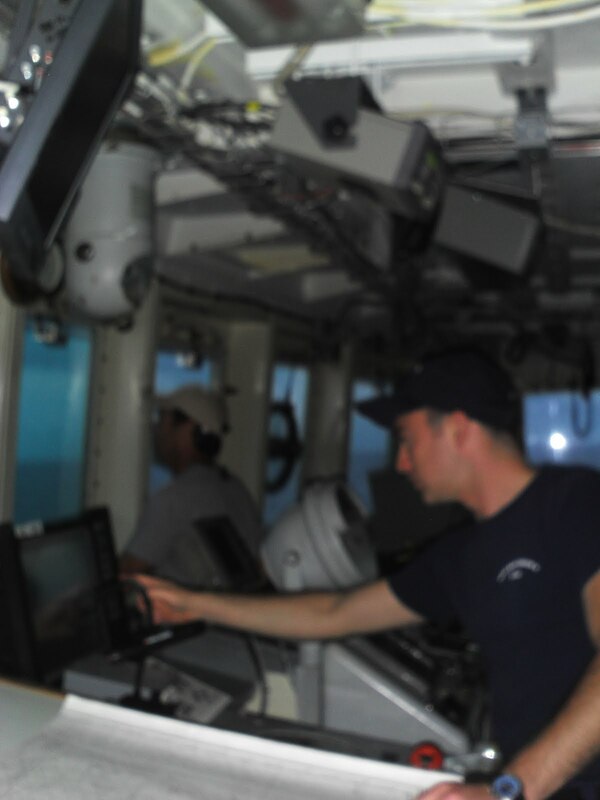 The OOD (Officer of the Deck) carefully monitors the numerous screens and readouts on the bridge control panels and keeps a sharp eye on the surrounding seas. While I have become familiar with several of the main systems on the bridge and can deduce a great deal about the Dyson’s current location and movement, I recognize there is much to learn to safely navigate and operate the ship. I am comforted when resting in my rack knowing there are skilled and experienced hands on the bridge 24 hours a day! Located five stories above the water, the bridge has a fantastic view. The bridge is wide and open and has windows in every direction. 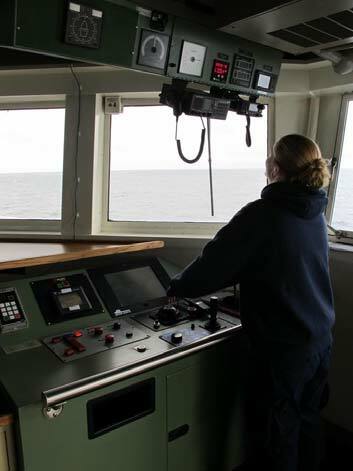 The bridge provides a great view of the operation of the ship and the surrounding seas. I am most impressed with the layout of the bridge. 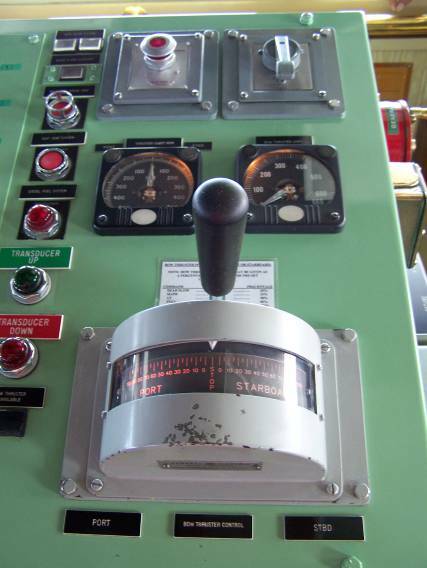 The ship can be controlled from any one of four stations located around the bridge. 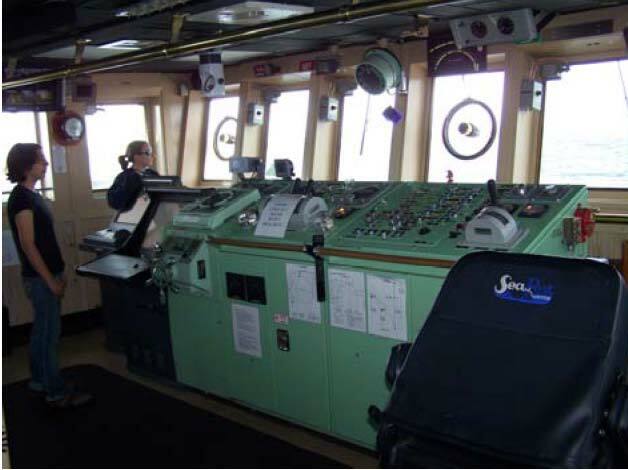 The bridge is laid out like a capital T: a central control station located in the middle of the bridge, a station positioned on both the port (left) and starboard (right) sides of the bridge, and a station located aft (back) facing the rear of the ship. This allows the OOD to pilot the vessel while keeping a close eye on deployments/operations being conducted anywhere on the Dyson. For example, when conducting an Aleutian wing trawl off the stern (back) of the vessel, the OOD can transfer control to the aft station and pilot the Dyson while facing backwards! In addition to the view, the bridge is also fun to visit as there is always someone to talk to and usually fun music playing quietly in the background. Recently, I have enjoyed watching the bow crash through 15-20 foot waves as we continue running each transect of our acoustic trawl survey. While the weather continues to make deployments challenging, we have still managed to fish a few times. 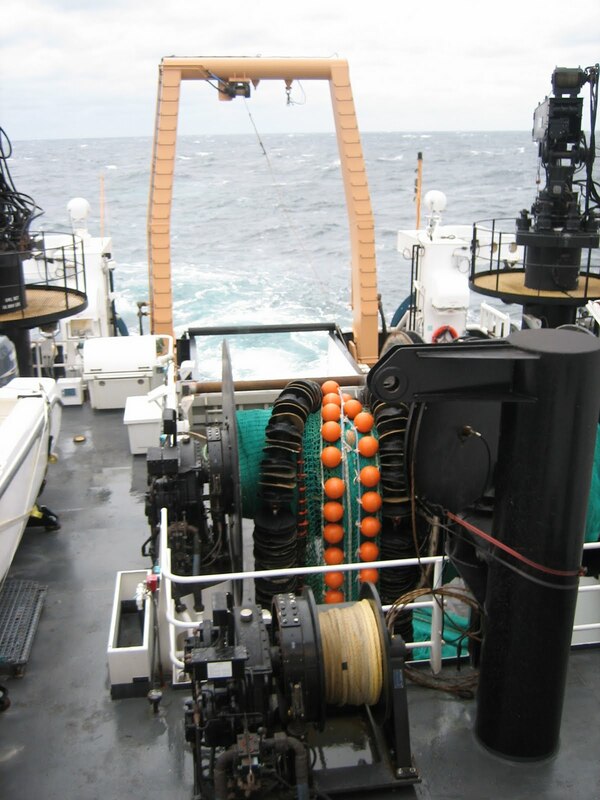 Interesting bycatch from these trawls includes seastars and brittle stars from the Tucker trawl and Pacific cod and sturgeon poacher from the Aleutian wing trawl. The summer solstice marks the longest day and the shortest night of the year. The word solstice comes from the Latin word ‘sol’ meaning ‘sun’ and the word ‘stice’ meaning ‘to stand still’. As summer days lengthen (meaning the sun rises earlier and sets later each day), the sun’s path through the sky takes the sun higher and higher above the horizon forming a greater and greater arc. At a certain point, the sun reaches its highest point. At this point the sun seems to stand still before slowly falling back to the horizon with each passing day. This point when the sun reaches its highest arc in the sky is called the summer solstice. The earth’s tilt on its axis causes the sun to travel slightly different paths through the sky each day and causes the sun’s rays to fall with varying intensity on different regions of the earth. Over the period of one year (one orbit of the sun by the earth), this variation in sunlight explains why the earth has four seasons: summer receives the most direct rays, winter receives the least direct rays, and spring and fall are times of transition between these two extremes. The summer solstice always falls around June 21st in the northern hemisphere (above the equator). With the Dyson surveying southeast of Pribilof Islands in the Bering Sea, the sun will rise at 6:30 AM and will set at 11:50 PM on June 21st. If you were standing at the North Pole during the summer solstice, you would experience 24 hours of sunlight (the sun would never dip below the horizon!) while 24 hours of darkness would be observed at the South Pole.